"Are you familiar with the children’s book Press Here by Herve Tullet? When I saw it, I fell in love. It’s an ideal read aloud book for an almost 3 year old. Each page has you pressing one of the circles or tilting the book. Turn the page and the scene shifts. 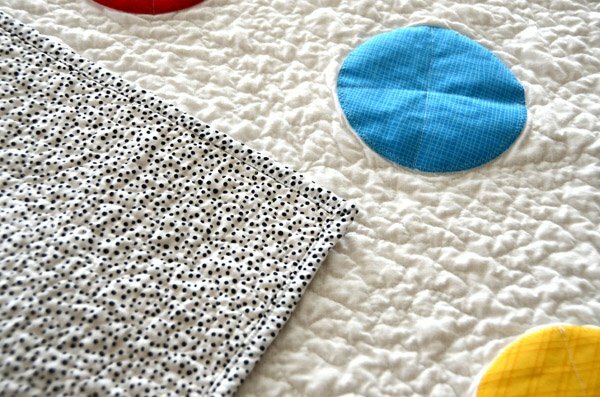 "Because Press Here is such a fun book AND my grandson T-Bone has a birthday this month I decided to make a quilt to go with his book. Remember, I am not really a quilter; but Mr. SH was going out of town for three days and I thought it was a perfect time to tackle this project. 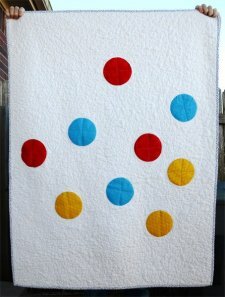 "Spoiler Alert: If you are a real quilter, you may want to hide your eyes now..."